Ohio, it turns out, has its own muck and its own muckrakers. 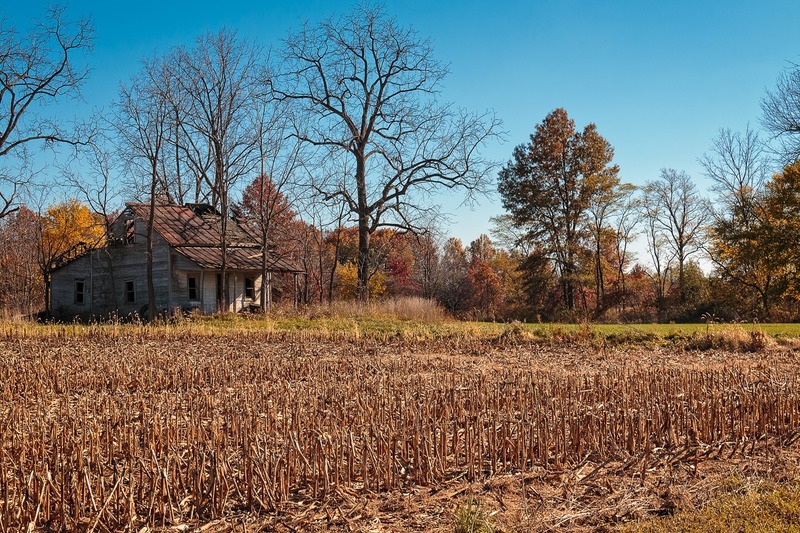 Anyone who travels across Ohio will see that corn and soybeans dominate the agricultural landscape, with white and other grains playing a supporting role in some areas. Produce—vegetables such as tomatoes, onions, celery, and so forth—is not something you would ordinarily see. Yet produce is grown in Ohio, in certain places, and one of those regions is the muck lands of northwestern Ohio. 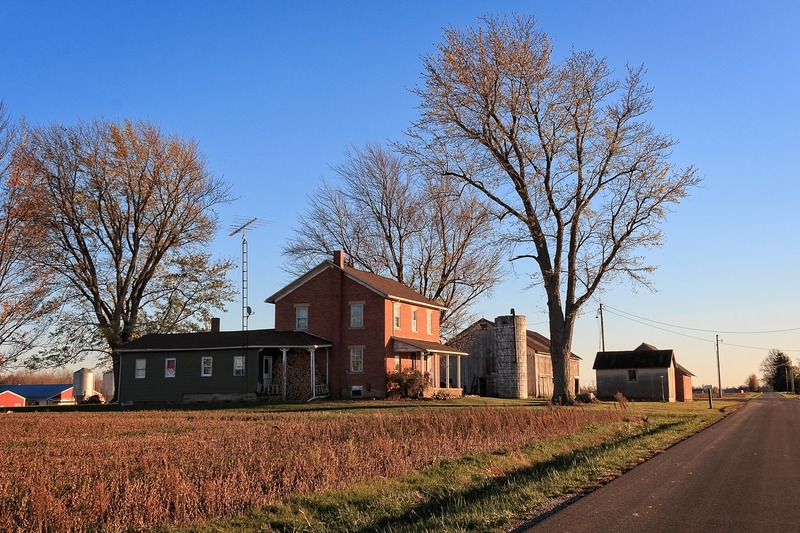 Much of northwestern Ohio is former swamp or wetlands, which was progressively drained through the middle and late 19th century to create a lush farming area. Some areas in particular, when drained, had very fertile soil, well suited for the growing of produce. These areas were often once lakes left behind by receding glaciers. They are the muck lands. Albert E. Wilkinson, of the New York State College of Agriculture, in his book 1916 Muck Crops: A book on vegetable crops, raised on reclaimed land, in some localities known as black dirt or muck, described muck lands as “low bodies of land which are generally swampy and often spoken of as being ‘peaty or mucky,’ a name commonly given to the soft, woody, black soil found in these places.” From sources such as the Journal of the American Peat Society I learned a great deal about muck lands, but I will spare you the specifics of acidity and drainage. 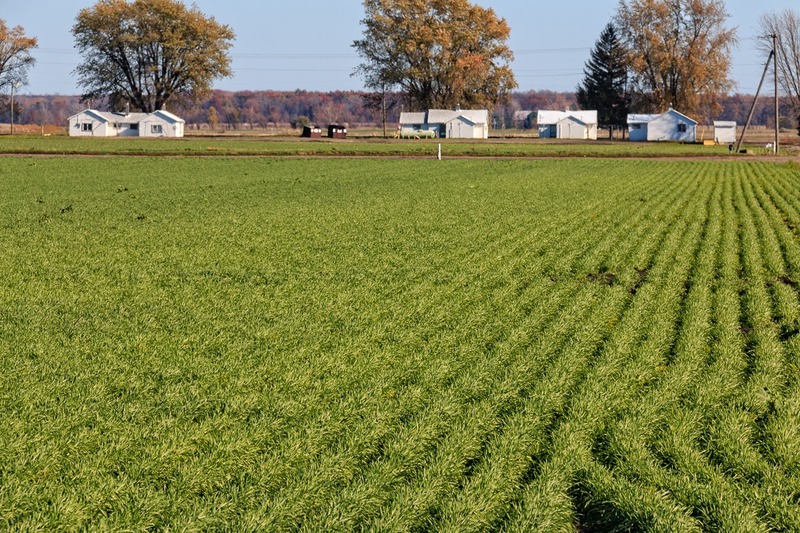 Ohio’s muck lands became important sources for crops such as celery and onions. But unlike many crops, including wheat and corn, which can be heavily mechanized, growing produce still requires a significant amount of physical labor. Where does that labor come from? In large part, from Mexico. 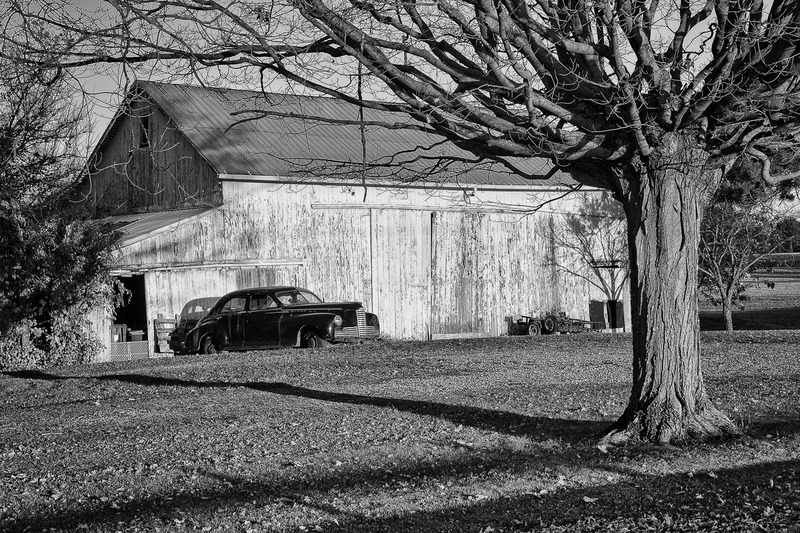 This is the third and final part of a three-part description of my photographic excursion into north middle Ohio in November 2016. As I ended the previous entry, I was leaving Plymouth, Ohio, for points west. I did not know, at the time, that just west of Plymouth begins the muck lands. I should skip ahead, for a moment, and note that the muck lands interested me so much, especially after I had researched them a bit, that I came back about five days later and took more photographs of the area, including more photographs of the places you see here, as well as others that I discovered. I will create a special blog entry that combines all of these photos together in a thematic whole, but here I describe them as part of my overall excursion. Just a bit west of Plymouth I came across the first sign that something was up when I drove past a long, low barracks-like building. I wondered if it might have been an old motor hotel from the early 1900s, so I found a place to turn around and drove back to examine it. It was clearly no motel; motels do not have sets of clotheslines out back. My next guess was that it was some sort of kid’s camp or church camp, closed for the winter season, of course. But if it was a camp, it was a pretty thread-bare camp. It did have this lonely basketball pole, hardly inviting. More interestingly, in the field behind the building a soccer field had been marked out. It was slightly mysterious. But there was nothing intrinsically visually interesting about it, so I took no photographs and left (I later drove back and took these photos, once I realized what I had seen). However, just a little further down the road, I came across something very similar, only larger: four long buildings very similar to the building I had seen earlier, arranged in two rows. Like the previous building, they seemed divided into apartments or rooms, and had clothesline poles next to them. 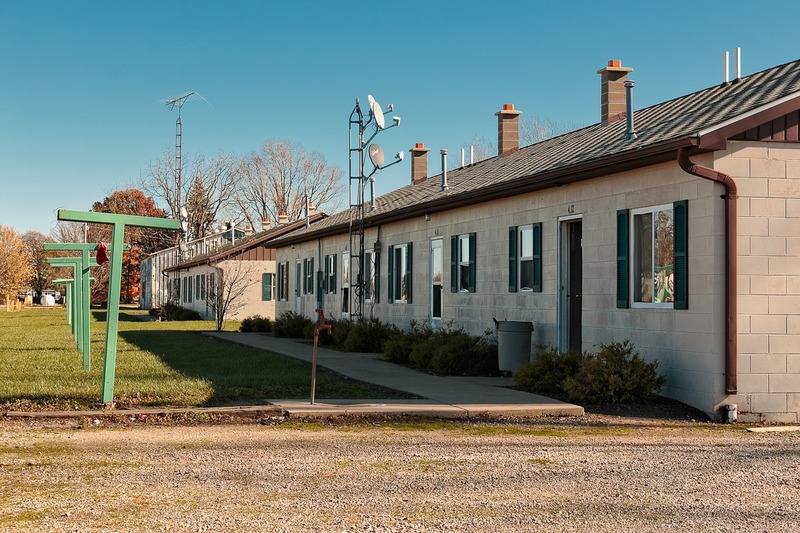 Furthermore, different “apartments” had television antennae or satellite dishes. Oddly, there were also old-fashioned water pumps outside. 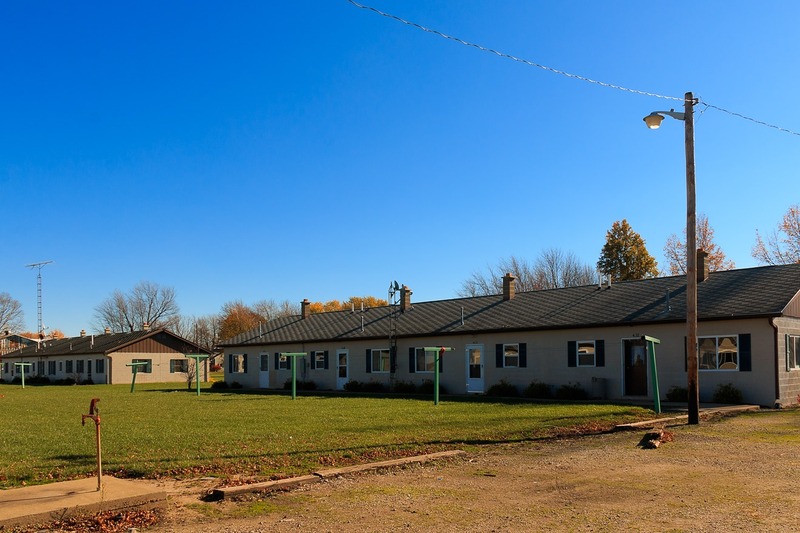 It was here that I began to suspect that what I was seeing was housing for Ohio’s migratory farm workers. As the muck lands were drained and cultivated in the late 1800s, farm labor was needed to work the crops, particularly at picking time. There was not enough native labor in the region willing to do this grueling work, so farmers began to import laborers, including African-Americans from the south, but particularly Hispanic farm workers from Texas and, eventually, Mexico as well. By the 1930s or so, Mexican farm workers came to dominate this labor force. 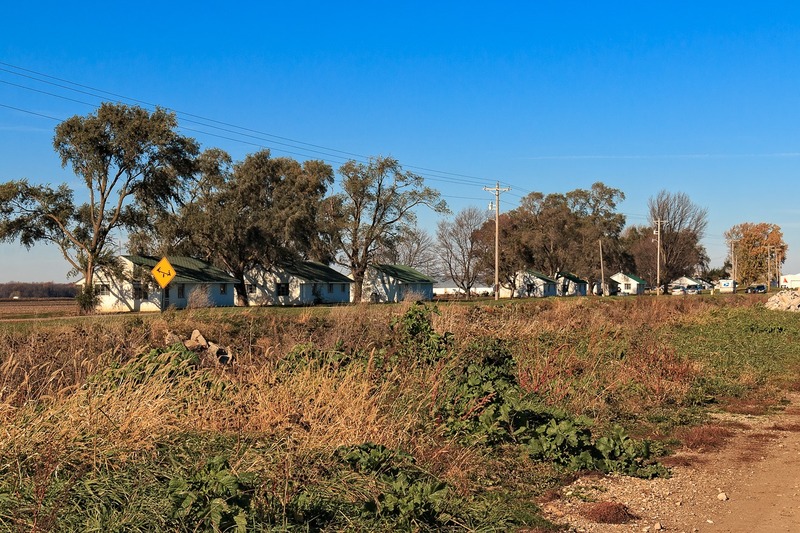 For many decades, migrant farm workers ranging in number from 9,000 to around 15,000 have come to Ohio to work the different produce-producing areas of the state, including the muck lands of northwestern Ohio. Legal migrant farm work in Ohio is regulated by the federal government, which issues a special type of visa, the H2A visa, and by the state. The H2A visa is a temporary visa for seasonal agricultural workers. Farmers who employ such laborers are required by federal law to pay for their transportation to and from the area and to feed and house them. Federal minimum wage, however, does not apply. 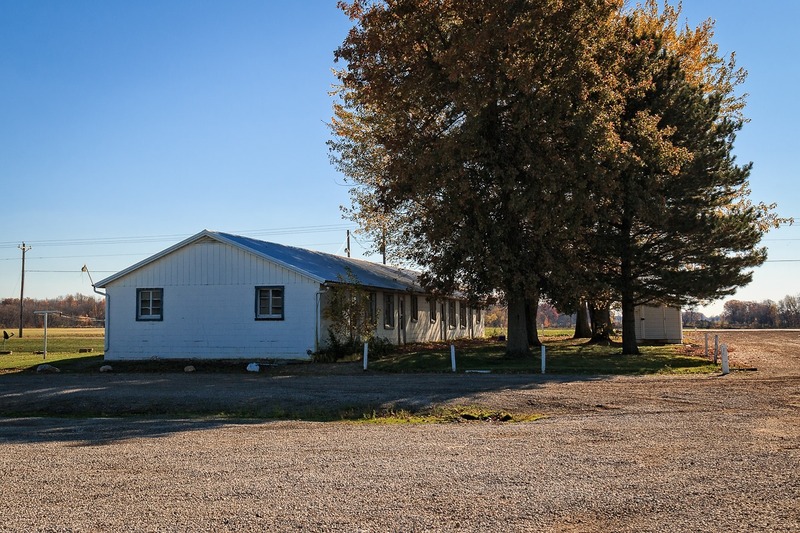 Ohio state law requires that migrant farm workers be housed in “agricultural labor camps, which can consist of buildings ( as seen here), but also tents, trailers, or vehicles. The minimum size is two or more families or five or more persons—so some can be quite small. The Ohio EPA regulates water and sewage issues—which are minimal. There were 88 total camps across Ohio in 2013, which gives some sense of the scale. In 2016, there were 104. 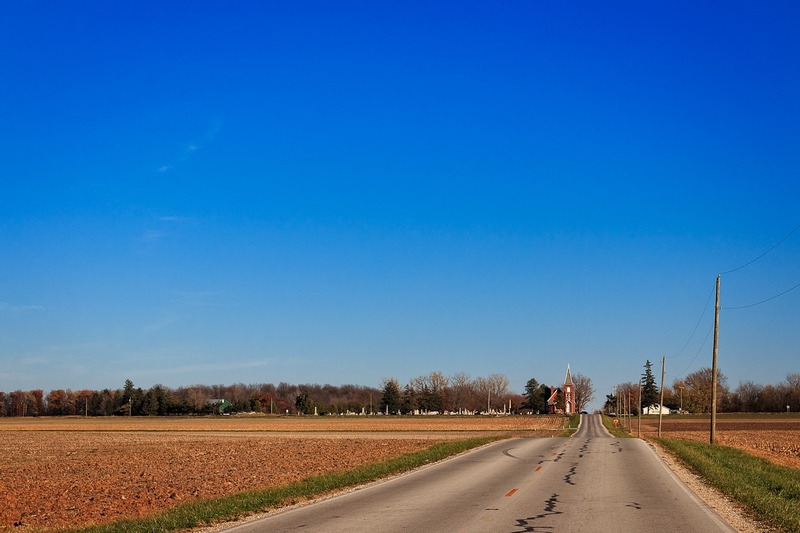 About 70% of Ohio’s immigrant farm laborers are undocumented. These can be divided into two categories: those with false papers who participate in the legal agricultural labor programs and those who are totally undocumented and are, in a number of cases, trafficked. Trafficked farm labors are totally underground and essentially have no legal protections; this can result in what is essentially slave labor under awful conditions. Some migrant farm workers come into the country as juveniles; others come as whole families, with the children working (agricultural work is largely excepted from U.S. child labor laws and what restrictions exist are often ignored for migrant farm workers). The water pumps gave me pause, but the buildings seemed reasonably well constructed. I couldn’t see inside them to tell the true conditions, though. It is possible for migrant housing areas to be very poor, indeed. In fact, at the time I took these photos, state law did not actually require running water at migrant worker camps. A law passed that only went into effect in 2017 mandated sinks with hot and cold running water, smoke detectors, partitions for “communal toilets,” and, if the toilets are non-flush, that they be cleaned once a week. Farmers were given five whole years to comply, however. 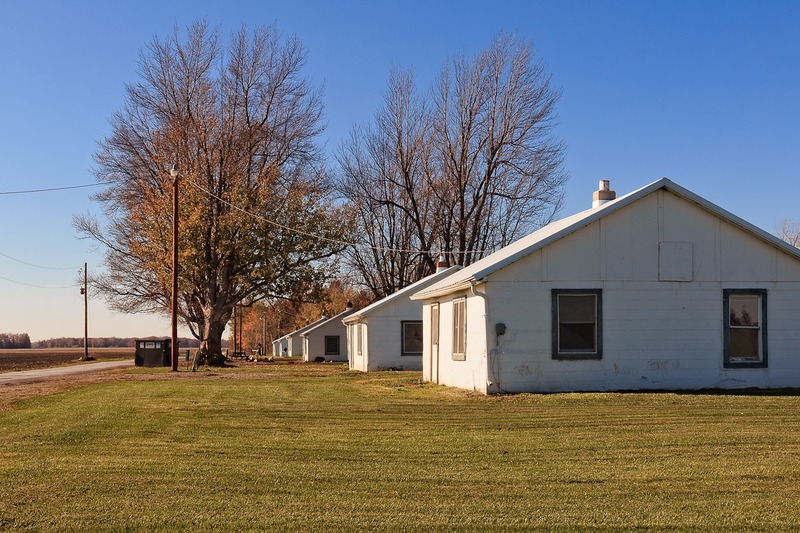 Typically, workers will stay in a camp for only a short period of time before moving to some other part of the state (or out of it) to do work at another farm, but some may stay longer. Looking across the fields from the second set of buildings I found, I could see more individual residences stretching down a road, all of similar construction, so I decided to check those out, suspecting they were housing for migrant farm workers as well. 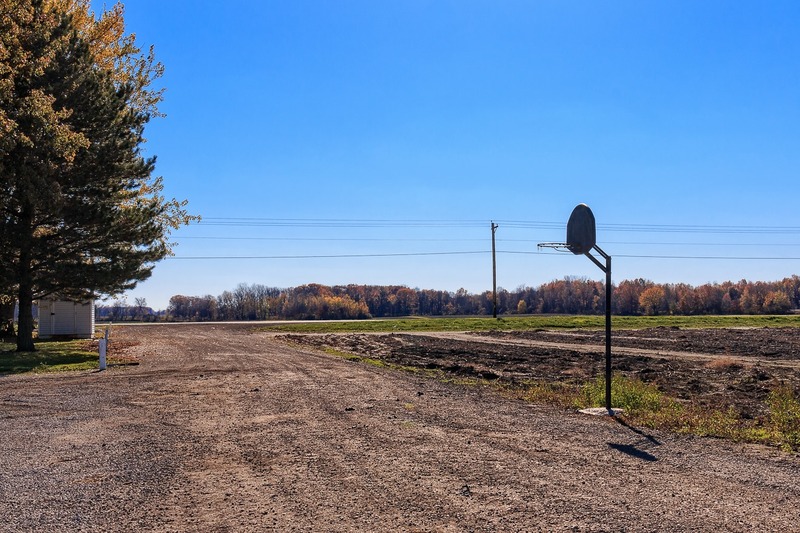 The nearby town of Willard, Ohio, is the center of this stretch of mucklands, as well as the adjoining hamlet of Celeryville, whose very name explains the muck’s significance. Much of the produce grown in this area is grown by a small number of large farms started around the turn of the (previous) century. The names of these farmers—Holthouse, Buurma, Wiers—can be found all around this area. 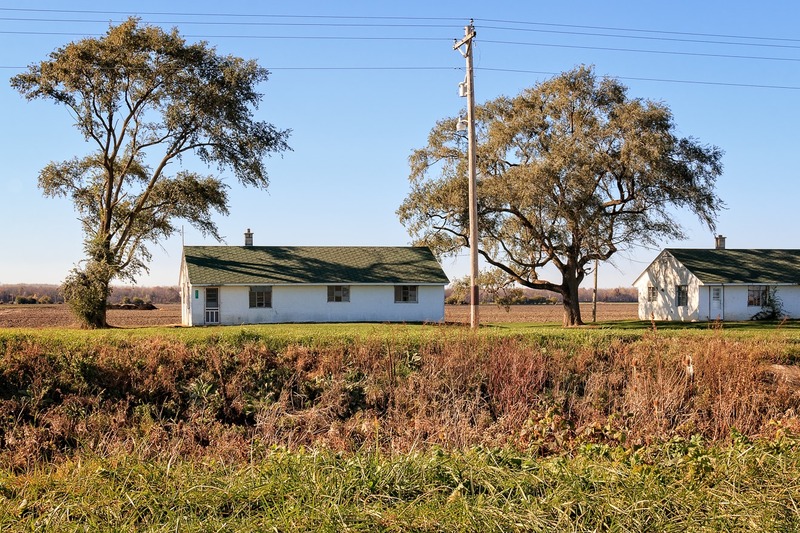 The above dwellings are probably part of Wiers Farm, though they are close to Buurma Farms as well. Holt Farms is to the north. I drove closer to this line of houses, which were located on a dead-end road that paralleled a drainage ditch. I made a similar parallel on the other side of the ditch, going up a dirt road next to a field. You can see the “children playing” sign here, another reminder of the ubiquity of children among migrant farm workers (whether the children themselves are laboring or not). These dwellings were separated rather than joined but could easily house a number of people, depending on how generous or spartan the conditions were. The buildings looked old and the trees around them were mature as well, so these dwellings have been here for quite a while. Even though it was November, and the agricultural season was over, I noticed that some of the dwellings were occupied. Some laborers can get longer visas, so these may be people wintering. 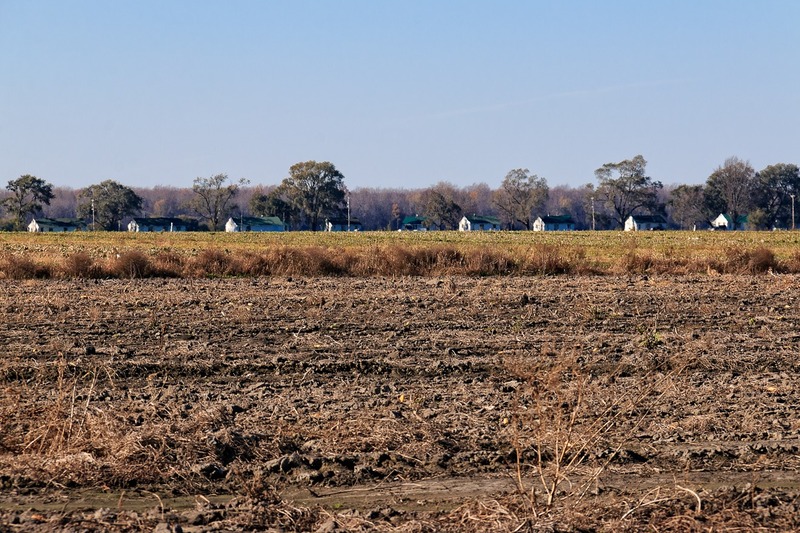 It is also possible that they are permanent farm workers housed by the farming concern. I’m just too ignorant to know for sure. Across another field, I could s see yet more similarly constructed buildings that were likely another set of dwellings for migrant labor. I continued west, skirting the southern edge of the Willard Marsh Wilderness Area—a remnant of the once-vaster wetlands that occupied this area—and found another agricultural labor camp, this one entirely abandoned for the winter. Many such places, I noticed, had the windows boarded up, whether to protect them during the off-season, or to protect the dwellings from intruders. It occurred to me that things might be harder for farm workers in this Age of Trump in which we now live and I was right. Even before Trump was elected, Ohio had seen the number of its migrant farm workers go down, which made many farmers nervous, because crops would die in the fields if there was not enough labor to harvest them. That, in fact, has happened in recent years, thanks to stricter immigration enforcement (or the threat thereof) acting as dissuasion. Some of the migrant workers themselves did not seem to be very worried. 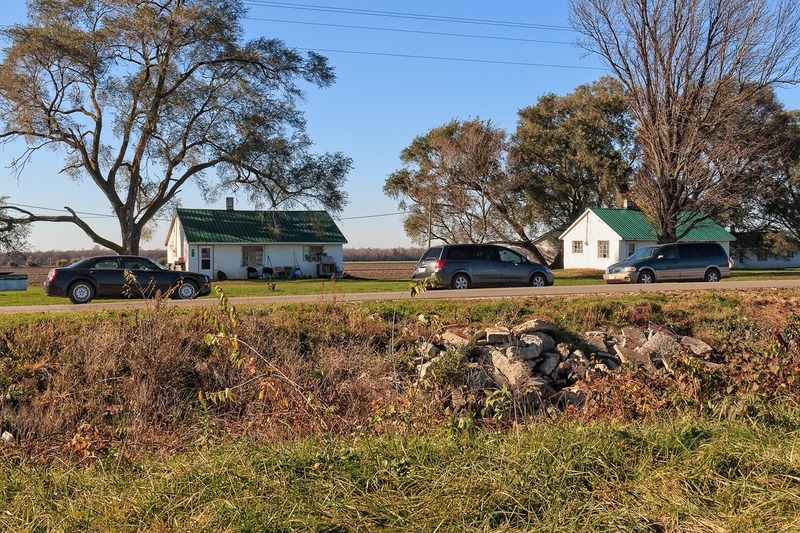 However, just a week or so before I wrote this blog entry, the New York Times, of all places, did a story on the farm workers around Willard. The Times piece, written by Miriam Jordan, told a troubling anecdote. This past winter, the Willard Area Chamber of Commerce decided to plan a “welcome back” party for returning migrants. There would be food, soccer, music and even rides for the kids. “Our community is very fortunate we have a group of people who come here every year to work,” said the chamber president. 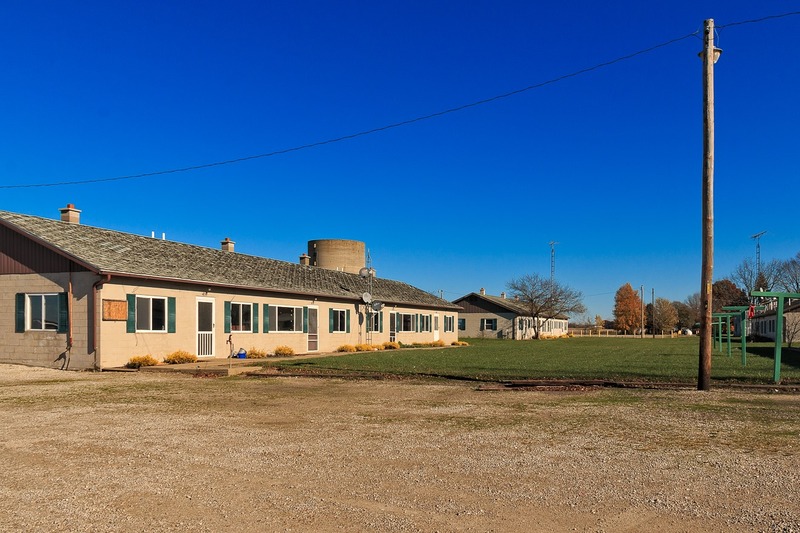 Others in the community did not like the idea of welcoming immigrants at all—even temporary migrant farm workers—and a backlash ensued. By May, the organizers canceled the planned event. There would be no welcome for the workers on whom the area’s economy largely depended. Modern day Wiers and Holthouses and Buurmas, descendants of the original farmers, all lamented the new, hostile attitudes. “We pray and hope the workers show up,” one of them said. Not only the farmers are nervous—a number of local businesses have seen their sales drop due to fewer migrant workers buying food or other items. If your celery or tomatoes are more expensive this winter, you may want to talk to your president. After a while, I was away from the muck lands and back to my usual haunts, looking for old buildings, old cars and interesting landscapes. Here I found a very typical old farming cabin. 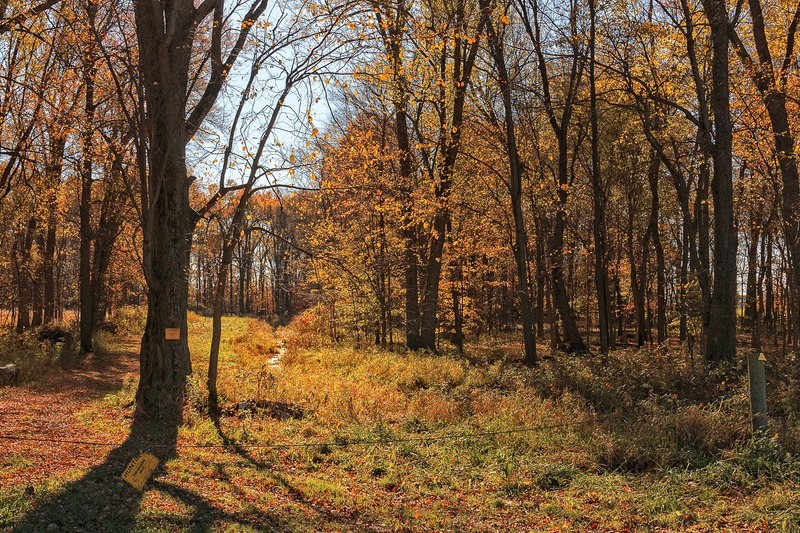 Western Ohio is largely shorn of the woods that once blanketed the entire state, but patches of woods remain here and there, with some probably harvested every now and then. The relatively young trees in this small patch make me wonder if that was the case here. 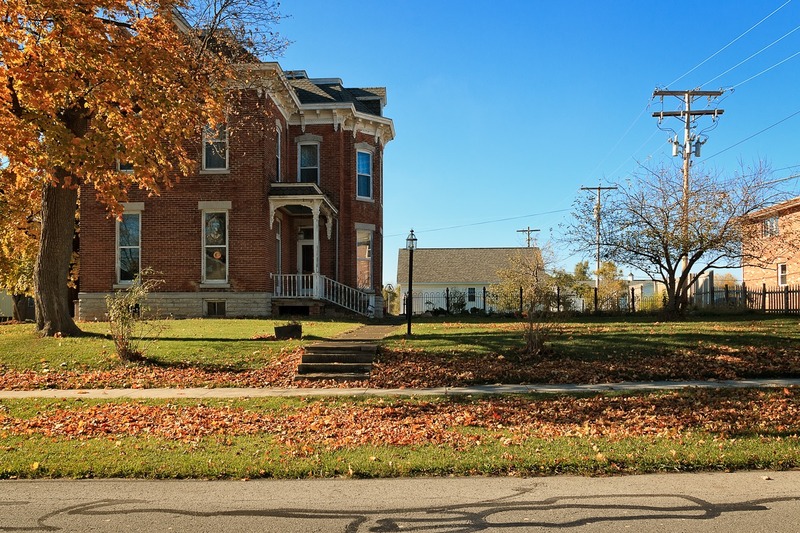 My unreliable GPS add-on placed this photo in the middle of nowhere, but I think I saw this attractive old house in the tiny village of Attica, Ohio (population 899, salute!). Another country cabin—abandoned, but no right-thinking Ohioan would ever think of abandoning mowing the lawn in front of it. Here’s a country view down a country road looking at a country church. I think that is likely the Pleasant Ridge United Methodist Church. 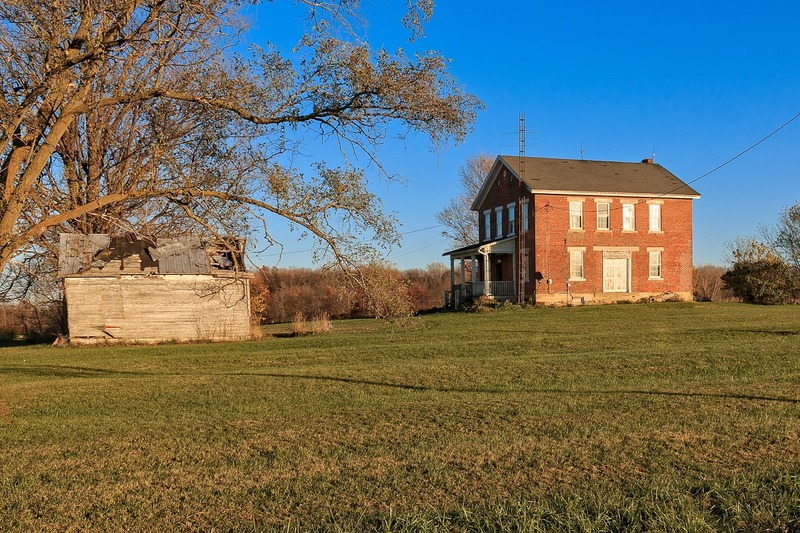 I thought this farmhouse was interesting in part because of the double side-doors, a rather unusual feature for a house, and clearly not used anymore. It made me wonder if perhaps that was originally the front of the house. I don’t think I’ve seen something like this before. 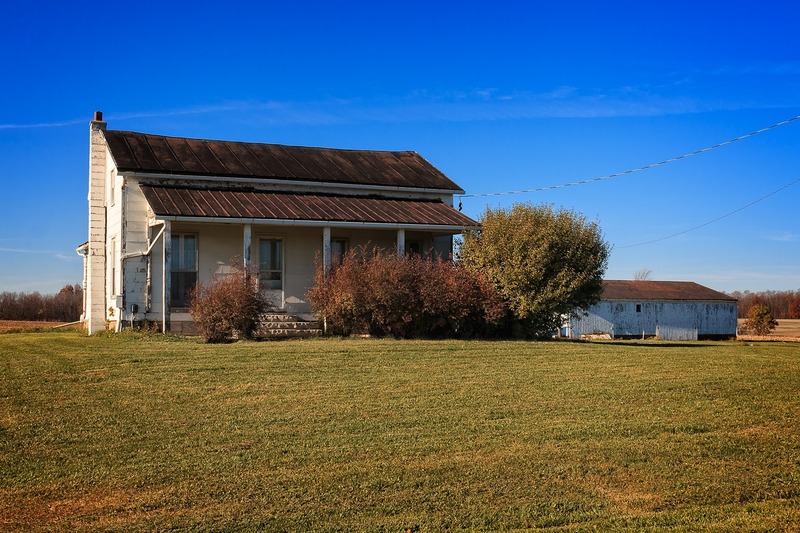 Here’s another typical country house with the common addition stretching out to the back. You can’t see it from here, but there was something interesting on the other side of the large tree in the front. What I found was an antique car—rather the worse for wear, alas—staring into the setting sun. I took a close up, but all emblems and so forth are missing. The design suggests it is from the early 1940s but I couldn’t tell you make or model. I am originally from Bridgeport, Ohio. I love reading about your excursions! Keep up the good work.